Marble Kitchen Countertops – Are They Worth It? When designing a kitchen or planning a renovation, there are certain large-scale elements that can set the tone for the space. One such element is the material choice for the countertops. While some opt to have the same material countertops running throughout the entire kitchen, others opt for accents or pops of one material against another, such as in a kitchen island or separate baking area. Many dream of the sophistication, style, warmth, and luxurious feel that marble can bring to a space, and kitchen countertops are no exception to that. What is a Marble Countertop Exactly? Marble is a type of metamorphic rock, and for those who aren’t fresh out of a science class, that means it is a rock that has changed forms, by pressure, time, and heat into another. Originally limestone or dolomite, marble becomes flecked with crystals, giving it a sparkly, unique, and layered appearance. The veins of mineral deposits in the marble slabs, make every piece one of a kind. Kitchen countertops are made from a wide variety of materials that vary in price, style, appearance, and practicality. From laminate to butcher block, glass, quartz and marble, the list goes on and on. Marble has long been one of those highly sought after building materials to use in a home. From flooring to bathroom tile and kitchen countertops, marble brings a look of timeless elegance to a space. When a home owner chooses marble for their kitchen countertop material, they have a large variety of colors to choose from, including shades of white, black, cream, green and pink. Despite the wide variety of colors available, white is the most popular choice for marble countertops, likely because of the fresh and clean look, as well as their adaptability to any space. Home owners also enjoy the embedded crystals and the way they shimmer and catch the light, as well as the veins of color variation within the slabs or tiles. There are two main types of marble countertops available: honed or polished. Both refer to a type of finish with polished resulting in a shiny surface and honed bringing a smoother more velvety look and feel. Can You Stain Marble on Purpose? As marble is a porous stone, it can be dyed to achieve a different color effect, and this was done in the ancient world by Greek and Roman craftsmen. An oil-based dye must be used, rather than water based, and due to the variations in the stone, a uniform look is unlikely to occur. The process involves heating dye and paraffin, adjusting the dye levels to reach the desired color, heating the tile, and then applying the dye with a sponge brush. As marble is a porous rock, it can scratch and stain, and is not particularly heat resistant. Extra care must be used with marble, especially when it comes to materials, foods, and cleaners placed directly on the countertops. Due to this factor, marble does require some maintenance in the from of a sealant that may need to be reapplied, approximately every six months. 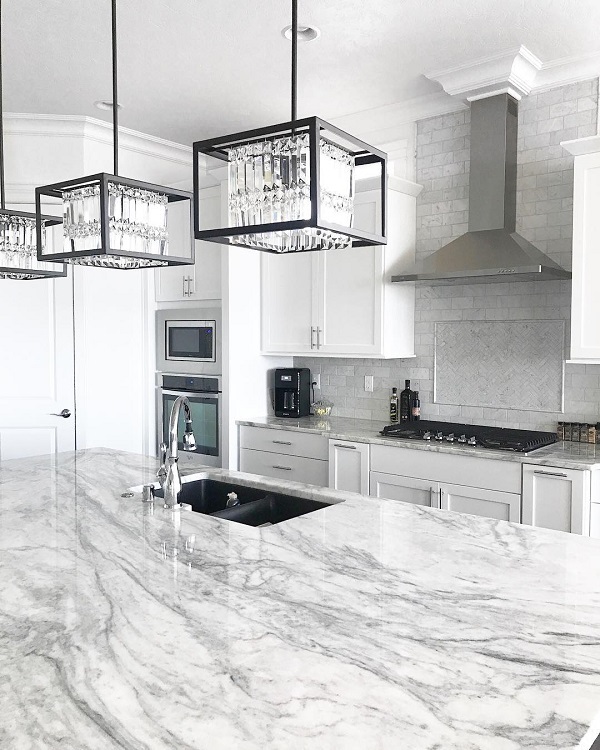 Quartz, on the other hand, rates very high on the hardness scale and is resistant to staining and scratching as it is a non-porous natural mineral. Quartz is also highly heat resistant so is able to handle a hot pan or pot on its surface. As quartz in a manufactured stone, it will not have the subtle variations in color, veining, crystals, and pattern that can be found in marble. Quartz is, however, the less expensive option of the two. As marble’s porous nature makes it vulnerable to staining and scratching, it will need to be sealed appropriately, a step that may need to be repeated over time. Care will also have to be taken when it comes to placing certain foods on the countertops. Acidic foods such as tomatoes, vinegar, or citrus fruits can actually leave small scratches (etches) in the stone. Special cleaners must also be used, nothing too abrasive or acidic that could also etch the countertop surface. For stain removal, it is recommended to spot treat with a poultice paste. Marble is also known to be vulnerable to heat, so no hot pots should be placed down without a heat mat. How Much Does It Cost to Buy and Install Marble Countertops? While prices will vary significantly based on the type of marble chosen, on average, marble countertops range from about $50 – $150 per square foot; the average price settling in at around $60/square foot. When considering installing marble countertops, buyers must also factor in the price of resealing it, which is said to be needed every six months or so. While marble is said to be an expensive choice, there are a few tips to keeping the costs down. The first is to install tiles, rather than slabs, and with the wealth of marble grades available, the look can still be achieved with choosing a less-expensive grade option. Also taking care of your countertops in their daily use can increase their longevity; choose an appropriate cleaner and be careful of what you place directly on the countertops. When it comes to putting money into your home, the kitchen is the best place in terms of investment return. In addition to that, it is also seen as the heart of a home. Meals are prepared there, people gather, and magical things happen. While it can be overwhelming facing the many details and choices necessary when designing or renovating a kitchen, doing a little research beforehand on exactly what you want, need, and what works within your budget, can be a huge stress-reliever. While marble countertops do require some extra care, as is so often the case in life, sometimes a little extra effort can have big results.